Billions of years from now, vaccuum instability could see a new universe wiping ours away. 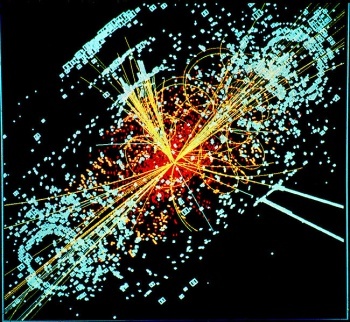 The Large Hadron Collider (LHC), that big particle accelerator that straddles the Franco-Swiss border near Geneva, has been on the recieving end of much admiration lately for finding more proof of the existence of the Higgs boson particle than anything before it. Naturally, having sort-of-maybe found this grand missing piece of physics, a few scientists have started theorizing about what the implications of its existence might really be. Their conclusion involves a situation where, billions of years from now, another universe bubbles up in the center of ours and erases it. All of it. Yes, the entire thing. Science! Working from the theory of vaccuum instability, Dr Josef Lykken of the Fermi National Accelerator Laboratory (Fermilab) says that knowing the mass of the Higgs allows for calculations that point to a cyclical universe of sorts, where all of space is replaced with new, different space once a critical point is reached. "It turns out there's a calculation you can do in our Standard Model of particle physics, once you know the mass of the Higgs boson," explained Lykken, speaking at the annual meeting of the American Association for the Advancement of Science (AAAS). "If you use all the physics we know now, and you do this straightforward calculation - it's bad news," he continued. "What happens is you get just a quantum fluctuation that makes a tiny bubble of the vacuum the Universe really wants to be in. And because it's a lower-energy state, this bubble will then expand, basically at the speed of light, and sweep everything before it," Lykken said. As strange this might sound, it might actually be true. Dr Lykken thinks it is, at any rate. "I think that idea is getting more and more traction...it's much easier to explain a lot of things if what we see is a cycle. If I were to bet my own money on it, I'd bet the cyclic idea is right," he concluded. However, it should be noted that nobody should worry about the possible implications of this theory because our planet and our sun will be long gone by the time any such event might occur. Besides which, we don't have to be all gloom and doom about it, do we? In its way, this kind of theory is a good thing; it gives us a beautiful, needle-sharp appreciation for the fleeting nature of time and the ultimate transience of all physical things. It should tell us to be the best that we can be in all things, because one day, some whippersnapper of an upstart baby universe is going to appear in ours, erase it from history, and basically start acting like it never existed.